“Polar bears are not evenly distributed throughout the Arctic, nor do they comprise a single nomadic cosmopolitan population, but rather occur in 19 relatively discrete subpopulations. There is however an uncertainty about the discreteness of the less studied subpopulations, particularly in the Russian Arctic and neighbouring areas, due to very restricted data on live capture and tagging. There is a new status table, agreed on by the group by Dec 1, 2013. Updated status and threats for all 13 subpopulations was presented at the Meeting of the Parties to the 1973 Agreement on the conservation of polar bears held in Moscoc [sic] December 4-5, 2013. So, there were some significant outcomes from that closed-door meeting of PBSG scientists at the International Polar Bear Forum, aka Meeting of the Parties in early December (see posts about the meeting here, here, and here)! The PBSG biologists just decided not to say anything to anyone until 10 days after the meeting ended, and in the most unobtrusive way possible. In contrast, at other official meetings of the PBSG at which population status reviews were conducted, press releases were issued as soon as the meeting was over. The press release for the last such meeting, held 29 June-3 July, 2009, was issued July 4, 2009. See the minutes of the discussion over that 2009 press release in Fig. 1 below; pdf of the press release here). No press release was issued by the PBSG after this early December 2013 meeting and the announcement that a new population status review had been completed was posted on the PBSG website, without media fanfare, well after the meeting concluded. And apparently, they couldn’t just release the documents in pdf format, like every other organization — they are making us wait until it’s in “web format”! What exactly are they trying to hide – more good news? Figure 1. 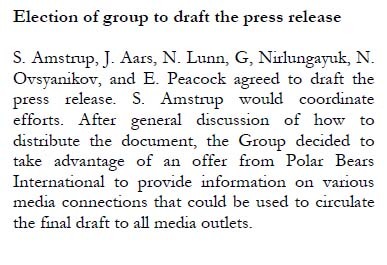 Minutes of the discussion of what to do with their press release, from the Proceedings of the 15th Polar Bear Specialist Group (PBSG) meeting (Obbard et al. 2010:11), at which a new status assessment table was generated. The finalize press release was posted on the PBSG website on July 4 and apparently distributed to suitable media contacts: Andy Revkin had a story up at his DotEarth blog (NY Times) on July 6, 2009. Since there is no longer a reference to a specific population number on the PBSG website, I think we can safely conclude the former “20,000-25,000” figure is going to change, something I hadn’t expected until at least the middle of 2014. If the population estimate had gone down, you can bet your last dollar we’d have heard about it from every available media outlet immediately after the meeting — so it must have gone up (more on that below). However, what’s also big news is the reference to “all 13 subpopulations” in the announcement, which indicates the adoption of new subpopulation boundaries, down from 19 previous subpopulations (Fig. 1). That’s a huge change that may have major implications for keeping track of polar bear population changes. Figure 2. The 19 polar bear subpopulations currently defined by the IUCN Polar Bear Specialist Group (PBSG), with a few extra labels added. I’ve rotated the original map 90 degrees (right) to make it easier to relate to the map in Figure 3. SB, Southern Beaufort; NB, Northern Beaufort; VM, Viscount Melville; MC, M’Clintock Channel; LS, Lancaster Sound; GB, Gulf of Boothia; NW, Norwegian Bay; KB, Kane Basin; WH, Western Hudson Bay. Courtesy the PBSG. Click to enlarge. Have the PBSG adopted the proposed boundary changes included in the document published in 2011 by Vongraven and Peacock (Fig. 3 below)? That proposed change reduced the 13 currently recognized subpopulations in Canada to 5. It seems unlikely, as this would have brought the global total to 11 subpopulations (not 13, as the PBSG announcement indicates), unless changes were made in other countries. A modified version of Fig. 3 is more likely. Figure 3. 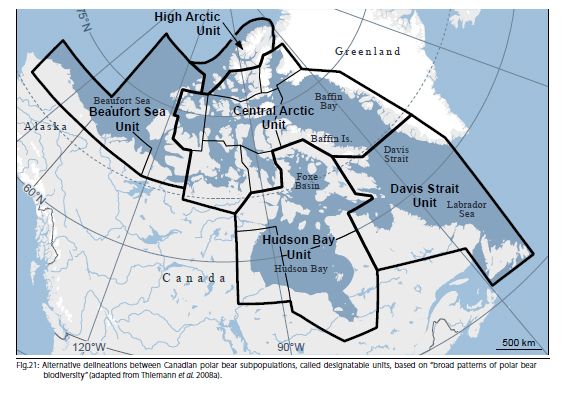 Proposed changes to designated polar bear subpopulation boundaries in Canada (Vongraven and Peacock 2011) would have reduced Canada’s 13 existing subpopulations to 5. Note that the unit marked “High Arctic” is currently including in the “Arctic Basin” subpopulation region (see Fig. 2). Some of these changes, but not all, may have been adopted by the PBSG in their reduction of polar bear subpopulations down to 13, from 19. I guess we’ll just have to wait a few weeks and see exactly what reconfigurations they made to the maps. While whatever they’ve done may play havoc with trying to keep tabs on changes in polar bear populations over time, I’ll reserve judgment on that — it may turn out to make things easier. That said, the primary rationale for the boundary changes proposed for Canada (as depicted in Fig. 3) is genetic data published 14 years ago (Paetkau et al. 1999, summarized here; see also Cronin et al. 2006, 2009). Why wasn’t this boundary change done years ago? We’ll also have to wait to see how much the population size estimates have been adjusted. This figure is much larger than contained in the latest official PBSG status tables (Obbard et al. 2010): half of the Barents Sea estimate (950-1,800) plus half of the Chukchi Sea estimate (0) plus the Kara Sea estimate (0) plus the Laptev Sea estimate (800-1200) gave Russia a total of 1,750 to 3,000 bears. Even the misleading PBSG “State of the Polar Bear” dynamic graphic (discussed here and here) – now removed from the website’s home page, but still present and apparently unchanged on a new page called “Dynamic population information” – suggested that Russia had only 2,700-4,800 bears. A total of 5,000-6,000 bears attributed to Russia could increase the global polar bear population total by about 3,000. We’ll have to wait and see if that’s what happens and if so, how the PBSG chooses to spin it. But really, what a bizarre start to 2014! There goes my dream of greater transparency, fewer tricks, and straightforward communication from PBSG biologists. They say they had the data ready for presentations on December 1, 2013 — let’s see how long it takes them to get the information “in web format.” I’ll check regularly and keep you posted. Paetkau, D., Amstrup, S.C., Born, E.W., Calvert, W., Derocher, A.E., Garner, G.W., Messier, F., Stirling, I., Taylor, M., Wiig, O., and Strobeck, C. 1999. Genetic structure of the world’s polar bear populations. Molecular Ecology 8:1571–1584. Download pdf here. This entry was posted in Conservation Status, Population and tagged advocacy, communication, genetics, IUCN, PBSG, Polar Bear Specialist Group, population status, population status review, press release, subpopulation boundaries. Bookmark the permalink.